Over the Summer I developed a volume-based indicator that I decided to call Volume Spyx. I have been watching it closely ever since and have posted several studies to the subscriber letters associated with Volume Spyx. Essentially, it looks at an array of securities and compares their volume. Spyx readings are calculated for the NYSE (and compared to the S&P 500) and for the Nasdaq. I primarily use it on daily charts, but weekly have also tested well, and there even seems to be some edge using intraday bars. What I found is that in general, high Volume Spyx readings suggest a bullish bias and low Volume Spyx readings suggest underperformance or a bearish bias. Below is a table taken from the S&P 500 Spyx Volume 1 document (Volume 2 should be out shortly). The document is 6 pages long and details market statistics related to Spyx levels. The document is available in the Quantifiable Edges Charts page. To access the charts pages you must be a subscriber, but trial memberships are available with just a name and email address. (Click here to sign up.) The table below looks at the period 1/1/1994 - 6/30/2008. While volume Spyx can be used to help establish a trading bias on its own, Spyx tend to show larger edges when used in conjunction with price movement or other indicators. Below is a study from last night’s Subscriber Letter which demonstrates how I might use Volume Spyx in my analysis. 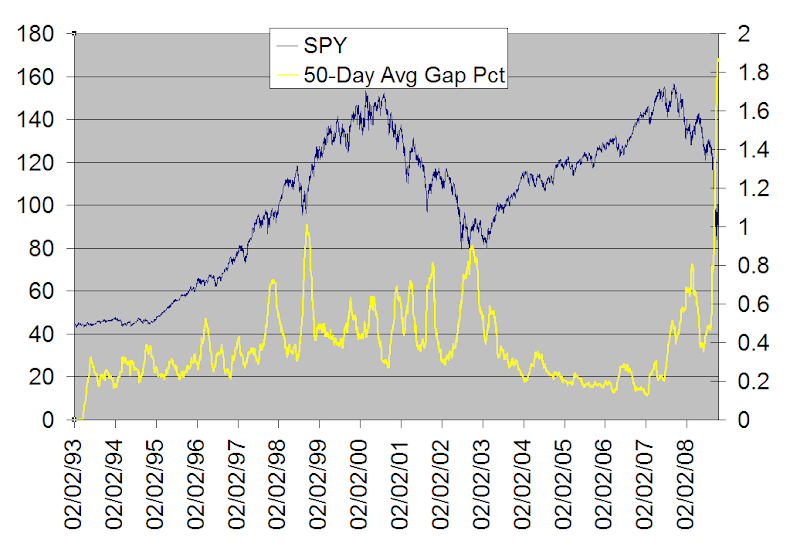 Low levels of Volume Spyx have typically led to market underperformance. This is especially true when they occur on an up day. 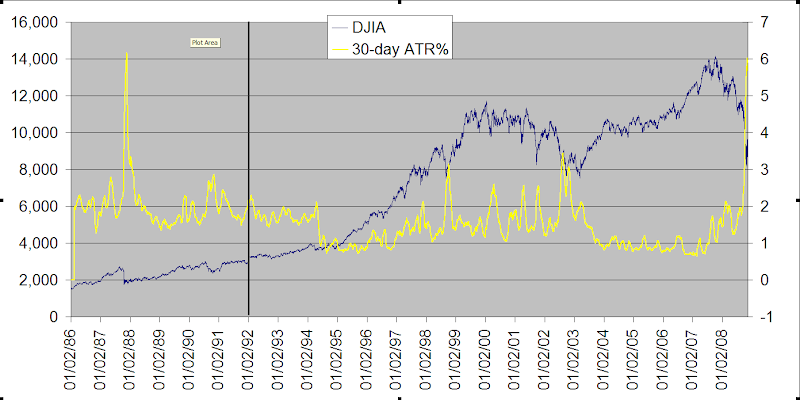 There have only been 2 instances where the S&P 500 Volume Spyx has come in under 40 and the market has gained 5%. Therefore I loosened the parameters to a 3% gain. I will be pointing out unusual Spyx activity and what it may suggest as instances arise. I’ve also decided that at least through the end of the year I will post the chart of the S&P 500 Volume Spyx on the Quantifiable Edges home page for all to see. Of the 13 instances, 10 closed higher the following day. If you give the trade 4 days to work then 12 of 13 closed higher than the entry at some point. The lone loser was October 16, 1987. That date is notable because it was the Friday prior to Black Monday. I’ve discussed in the past that it is a common misconception that a low VXO is a bearish indicator. When the VXO becomes extremely stretched, as it is now, then that changes. Instances are a little low, but both winning percentages and Win/Loss Ratio are very suggestive of short-term bearish implications. Also of note is that 18 of 20 instances (90%) closed lower at some point in the next 3 days. There was only one instance that failed to close lower than the entry at some point in the next 7 days. That instance was 10/19/98 which essentially traded sideways for 7 days before beginning a new leg up.